After saying I would not do more changes to the Photo Rig after my Galapagos Trip I felt I needed to. 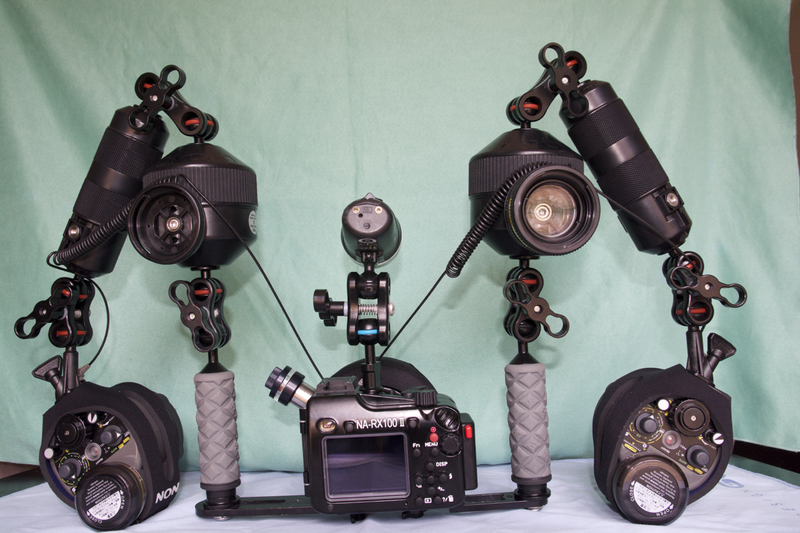 So this is the photo rig that I will be taking to the Red Sea for a workshop with Alex Mustard. I got bored with the STIX floats giving away moisture in the luggage and creating issues to other metal parts so decided to completely eliminate the ULCS arms and replace them with Inon float arms size M (they are a tad shorter than the ULCS 8″). So the arms segments are now 1 Inon Mega S segment and 1 Inon Float M segment connected by a clamp for float arms (2″ effective length). This makes for a fairly long arm that extends to 19.5″ each side from the tray. 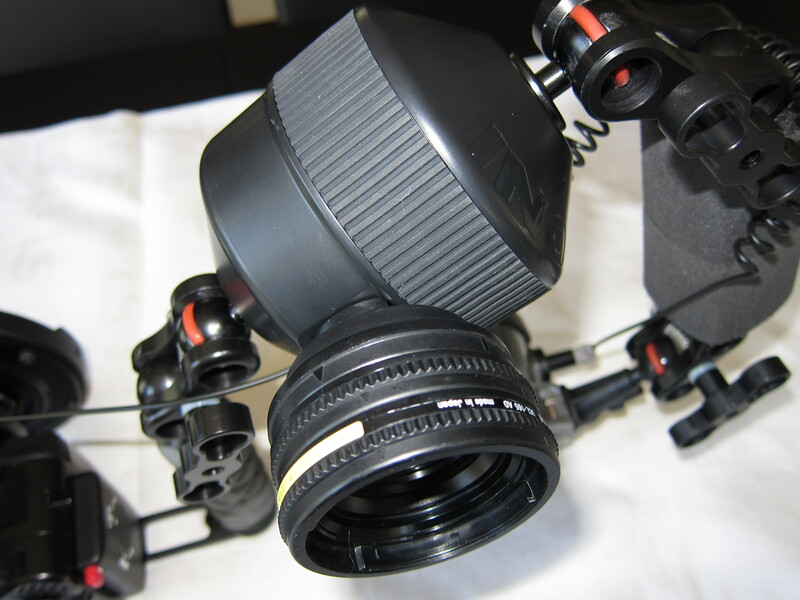 This rig is 481 negative in fresh water (with one close up lens) and weights 5.7 Kg so should be around 324 grams negative in salt water and with the fisheye off (Inon UWL-100 28AD with dome) will gently go up. The leak sentinel is not on the photo but will be also there. The strobe sleeves give quite a lift in shallow water but being neoprene will compress at depth. 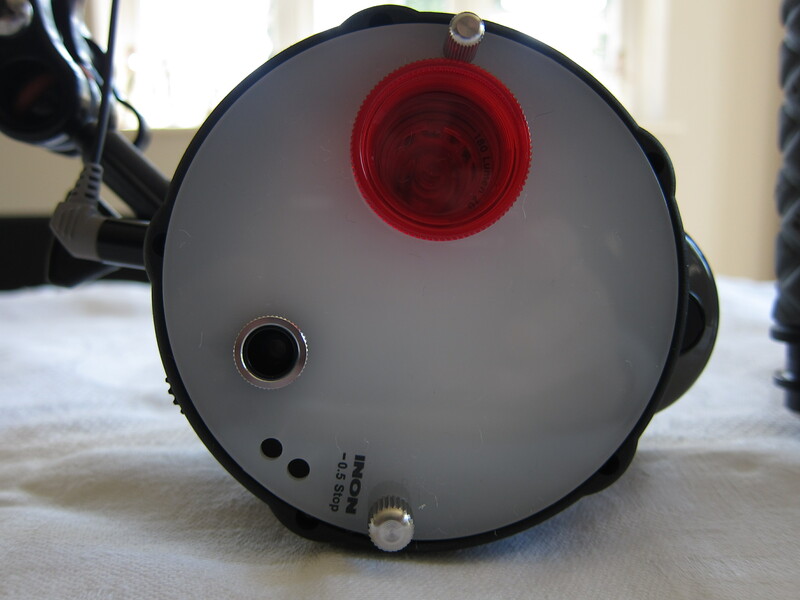 The Sola 1200 (used as dive and spotting light not as focus light) is now attached through an M10 ball adapter and clamp so that is mounted exactly in the middle of the port. I have also changed the diffusers to the AUTO version to use the Inon external auto function, useful to avoid flat shadows. You will notice the metal ring on the exposure meter of the strobe. As usual I have bayonet mount 28AD version to be specific, I re-used my old UCL-165AD using an adapter. The float arms host two lens holders. Hi, what do you think of the new aquapazza housing? I was thinking that since the standard port can be swapped out for an aquapazza 28LD port, this might be able to possibly remove vignetting completely with say, the Inon UWL-H100 28LD etc? I would appreciate some of your thoughts. just a question for understanding. You write the complete rig is about 481 grams in fresh water and about 324 grams in salt water. How do you calc ulate this and did you ever try the bigger Mega Float Arm M? I’m currently plan to buy a Nauticam + UWH-H10028LD +UCL-165LD+M67+InonZ240+Nauticam-FlexitrayII. I calculated about 1400 grams negative for the complete setup. So I want to add 2xMega Float Arm M (+1300) and one Float Arm S (+75) to balance this. What do you think about this? Hi, I tried to find information about buoyancy of NA housing with RX100II inside, but without success. Maybe you measured it and could share underwater weight value. Hi mate, very nice rig with Sony RX100. I was hoping you can help me. I have a Canon S100 in Canon Housing with Inon bayonet adapter to mount a UWL-H100 wide wet lens. After a year or more I am fed up not being able to get sharp images so I am upgrading to Sony RX100 III. However, I shoot almost always wide-angle so I am having trouble deciding which housing (Nauticam, RecSea, Ikelite, Fantasea, Sea&Sea) mostly because I don’t want the same problems I have now with the wide angle never being sharp. From what I can tell, all housings except the Sea&Sea will accept the Inon UWL H100 wide lens but which housing has been proven to have the best results? Also, is it possible to convert my UWL-H100 lens from bayonet to thread? I see you have done the other way (thread to bayonet) so was wondering if it is possible the other way. Also, do any of the housings come with bayonet mount for UWL H100 already? I think that thread is better than bayonet because my experience with bayonet with Canon was bad. Of course, maybe there is a better wide angle wet lens such as the FishEye FIX UWL28 and also the iTorch M52 UWL but I have no experience with them. Becoming quite confused. I know I want Sony RX100 III and I know I want wide angle wet lens… but after that I am hoping for some help. Sorry for such a long message. Thanks for all the excellent information you provide on your blog. I’m looking at purchasing the RX100 M2 and Nauticam housing. At that point my budget starts to thin out, so I’m wondering if you think I could get by with an Inon LF1100W light (with Inon tray and ball adapter) and macro lens until I can afford high quality strobes? If so, would that light also be suitable for assisting with wide angle photography? Once I can afford strobes my plan is to move the light to the center of the housing to use as a fill/focus light. In terms of additional lenses, I’ll follow the advice in your threads and purchase the UCL-165AD with adapters. Do you happen to know how close that lens will let you get to the subject? Does this mean if I do not have any lenses yet, you would recommend going for the UWL H100 28LD and UCL 165LD over your setup of UWL 100 28AD and UCL 165AD? Have you tried the 1.10 firmware update for the rx100ii? Apparently it reduces the vibration and noise of the lens during auto-focusing. I have had problems while focusing at Macro, not sure it this firmware will help. I really enjoy your info. I recently replaced my old Canon S90 in Fisheye housing with a Sony RX100 M2 (refurb from Walmart). Given this was a secondary rig, I picked the Ikelite hsg which is now on sale (-$100). I already had an Inon 100 Type 2 and will be testing it out in my pool this weekend. I use Inon D2000 strobes with floats. Can you give me any tips re: settings. I am using basic ones for Olympus PEN meaning manual exposure and auto flash (S-TTL). So far so good. I need to blow up my images to be sure Type II works. Wouldn’t I be regressing to go back my Type 1 ring? I confirmed with Reef Photo, that Ike hsg was ok to use with Inon Type II. Got some shots on one Blue Heron Bridge trip. Looking at them now. Thank you for all the wealth of knowledge you are willing to share. I just recently purchased a RX100ii and I am trying to decide which housing to purchase. I obviously see you choose nauticam but I wanted to know your opinion on Recsea (seems like a solid option specially with theDyron Quick Release Kit that permits 52mm and 67mm lenses); the Sea&Sea also has a 67MM thread like the Nauticam so I was wondering if you can use all the same adapters and lenses you recommend (this would probably be my first choice, smaller than nauticam, larger front dial and looks well built). Thank you once again. Thank you for your quick response. Between LD and AD which would you choose and why? Hey Interceptor! I will be buying the rx100II with the nauticam housing and I’ve read that the UWL-04 fisheye works really well…thoughts? Also what do you think about the Nauticam CMC lens? 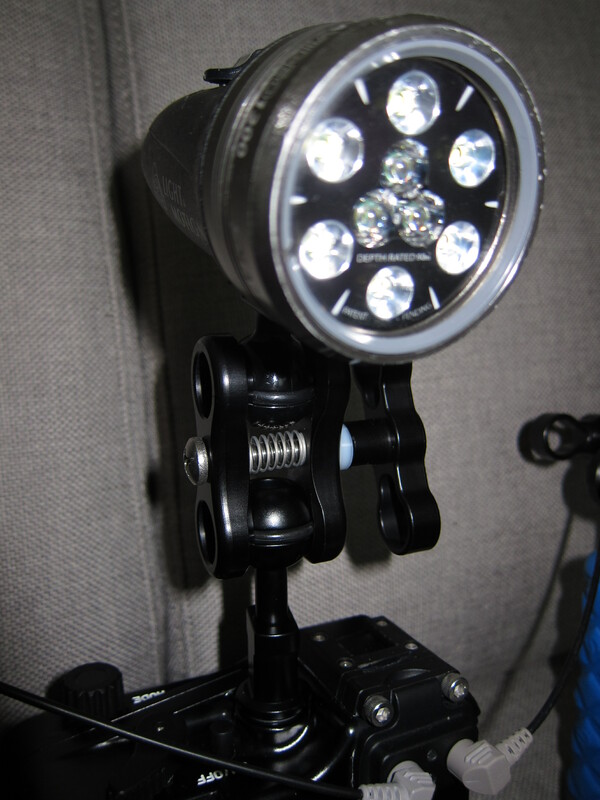 I noticed you mentioned you use your Sola 1200 as a “spotter” not a focus light, what do you mean by that? Interesting reading and I hear you about the threaded wet lenses, as I also dropped my wide one, but lucky dandy bottom :-). Got them as I was in a hurry when I bought the rig, but your info, has me thinking to look again. Now for my first question… did you get the Nauticam vacuum pump, my understanding was that it was not compatible with the RX100-II housing..? Are you still offering purchase assistance for this setup for $45? I’m looking at upgrading to the rx100. From my 8year old Nikon coolpix in ilelite housing, it was a very nice camera in its day , and did capture very nice colours .i did find the ilelite housing to be very boxy and not easy in the hand. 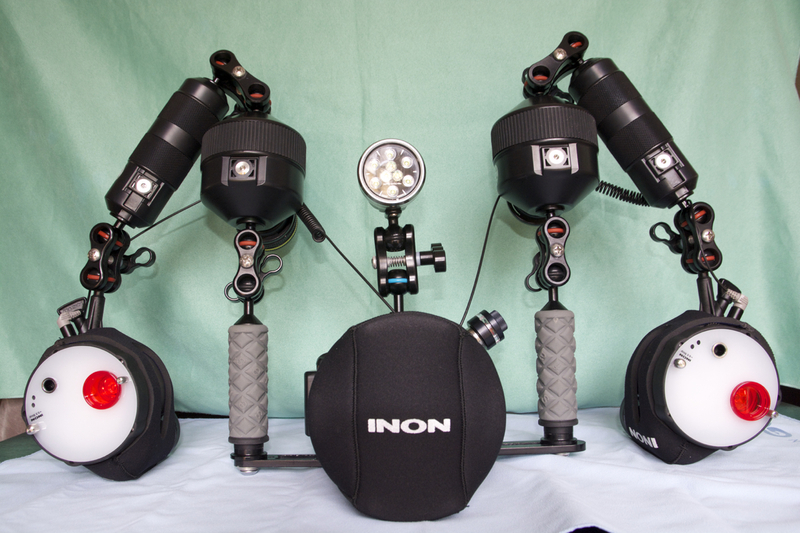 And the 3 of the inon ucl 165 m 67 stackable macro lenses . I would like to be able to use my old lenses and strobes if possible . I’m not really looking to do video . I mainly do macro , super macro , and some wide angle stuff . Is there a series of the rx 100 that is better for underwater photography? Is there a housing you would recommend to work with my lenses and strobes ?? Would I just use fibre optic to fire both strobes? Or is there another camera set up you suggest ? Any thoughts about the new ish panasonic camera with similar specs ? First, I have a low budget so i dont know if i’m going to buy RX100 or RX100 II, what are the differences and wich one should i buy? Do i need this ? – m67 to 28 adaptator ? -Inon 28AD to AD adapator ? Tanks and sorry for bad english, i’m French ! Right, I will maybe try to get an nauticam or isotta housing then, what are the differences betwen rx-100 M1 and M2? Hi there, why did you use the M10 mount for focus light instead of the cold shoe mount? Do you ever use both? Hi, very interesting thread and thanks for sharing you knowledge and experience. I am about to choose between the RX100iv and RX100v, nauticam housing, for mix use of video and photos. A wide angle wet lens has been recommended. What is your view on ideal wide angle lens? Curious why you say the RX100M2 is your favorite among all RX models for photos?